I think the icon for unseen threads should be more brighter. Couldn't make the difference between seen and unseen threads. EDIT: Forgot to mention this is for threads where we posted into. Also, maybe make some space between the reply notifications toggle and reply submit button on mobile? Edited May 31, 2018 by Jinx. I appreciate what you guys were trying to do, but if I'm being 100% honest, I don't really like the new theme at all. With that being said, I'm sure there are a ton of people who are loving the new theme, so my advice to you is add the option to change between themes, like how you could change between the latest theme, and the 2013 theme. The page is very slow in Safari, I can't even write on it. 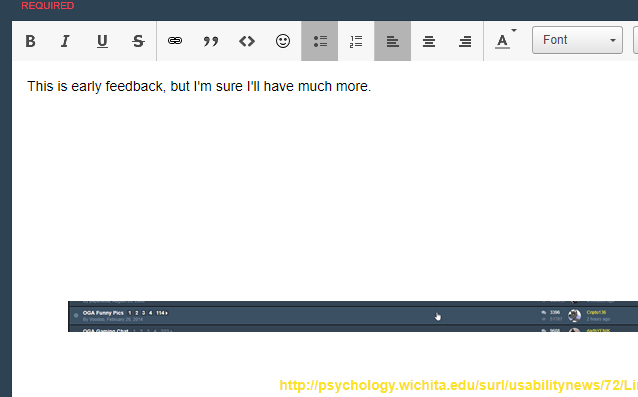 This is early feedback, but I'm sure I'll have much more. Avatar is better above name and title. Avatars should consistently be square crop, not a mix around the site of circle and square. Avatars shouldn't have their aspect ratio stretched. User info section on individual posts (the left column), would benefit from a different darker background. I really, really hate that clicking onto a new page number doesn’t go to that page, but instead adds it to the loaded content visible on the page. I seriously hate this sort of behaviour. There’s no indication on change of link when hovering over topics/sections in the forum lists. I also genuinely hate when sites make entire areas like this a link. I click these sort of links by accident all the time when simply clicking with the mouse to bring the window to focus, and it does my f*cking head in. Visible white line beside like button. Black colour should blend with the site more, #1a1a1a or such. Icon or colour should change after the user has liked a post. I believe the search bar should be to the left of the other content in the top bar. Why is this all top aligned? Or more, why is there more space on the bottom? When you make a bullet or numbered list, the text all becomes white and as such invisible in the editor. Bloody hell. Can't delete images once they're in a post? This one below here won't go away. Padding on lists is a little woeful. When in a list, the line break from a Ctrl+Enter should not make a new bullet point. If you agree with points here, either quote the post or give it a like to increase the visibility - It's all important for moving forward with the site, and now is the time to get feedback heard. Formatting is hard with invisible text. That's a big 'ol YIKES from me fellas. Honestly I can go write a thesis on everything wrong on the new design, but it really boils down to this -> You've gone to Invision Board V4 and instead of designing something fresh from the ground up to fit IP Board V4 standard, you've tried to just make the V3 theme fit in the new layout which obviously doesn't work well, the colour scheme, the inconsistencies on everything. To give you an idea, look at the quote/like section, there's 4 different colours, the only 2 texts (Quote and "Like") has 2 different fonts in 2 different sizes in 2 different colours, the like and multi quote isn't even the same size, colour or even base design language. The old website wasn't going to win any design awards either, but compared to this mess it was much better. EDIT: just looked at the profile page and there's 5 different shades of blue and all the fonts are a different shade of colour alongside different fonts, the formatting isn't even consistent, there's text that's aligned in the centre and then some on the left. f*cking hell. Like icons color - Those black circles are rly distracting... I think they would look way better if they had the same color as the text next to them. Just like that "+" next to quotes. Overall I think this theme has too much white and black right now and because of that it doesn't look as good as the old one. No signatures? Not a good move. Also, I was going to quote EmSixTeen, but the new quote feature is quite tricky to use. I also had to highlight his text just to be able to see it. White text on a white backdrop? Hmm. I'm not sure that's a good mix. Better than having pop-ups, atleast. But the notification sound, and the "stroking your ego, one post at time" is f*cking cringy. Look at all these inconsistencies. Did someone blind design this? It's a decent overhaul and I've been on the better side of mixed about it. I do appreciate the efforts however. I've been getting endless notifications for every topic I so much as glanced at. It's quite annoying and not something I was bombarded with before. I literally unchecked every box - even that for my own likes and people responding to my own content - and clicked do not send notifications only for my inbox to blow up anyway. Oh and there's on screen notifications too so it's worse. And people say LJT is bad! Also, I definitely checked "sign on anonymously" and I'm plainly visible as clear as day so that didn't work out either. Unsure why either of these features seem to be ineffective. Might just be me but everything feels needlessly oversized and it strains my eyes trying to comprehend everything, though it's probably just because I'm not used to it. I appreciate you guys were trying to update everything but trying to make everything "slicker" but everything just feels worse. First off, what happen to join dates AND signatures? Signatures in particular are like a massive staple in forum culture. I don't know who's idea it was to remove it but it's stupid. Why are usernames and the little blurb thing above your profile picture now? Might be a little nitpicky but it looks odd. Since I am nitpicking "Stroking your ego, one post at a time" sounds stupid and cocky. I don't know why someone would sit back and go "Ah yeah we need a new forum slogan, how about stroking your ego?". Just stupid. It really feels like you guys were trying to cater to the mobile users WAY to hard. I don't know what the platform statistics are, but I can't imagine there'd be more phone-posters than desktop users. Over all, for me theme looks better, site runs faster but there is stuff i dont really like here and there, first off im not sure why but i feel like posts take too much space on my screen and it wasnt the case before, second Nick names should be under the avatar and not above it in my opinion, but for now i dont see any other issues or disadventages with the new theme, if i'l notice anything more i'l mention it here later. Since this seems to be a reoccurring concern: Signatures are not gone and will be enabled in due time. Thanks for the constructive feedback so far! The priority was always to get the site online. The layout will be tweaked on an ongoing basis. There's a lot of features that just can't be changed right now (or ever), they're a part of IPB4. As for emoji, they appear fine here and are likely more of a browser thing than anything else. Chrome shows them properly. Notification sounds can be disabled in notification settings. Avatars being circled and squared is just something that needs to be tweaked in due time, the global forum option didn't change them everywhere. There's a lot of features that just can't be changed right now (or ever), they're a part of IPB4. That's not true for more things here. This seems like an appropriate thread to say thank-you to the admins for keeping the GTAForums running and for opening them last night :) These last 3 days were unbearable It is a pretty cool place to be at. We need the darkened blue background behind our avatars and info again. With the icon first, username second, tagline, user status (i.e. "Staff", "Mod" title), joined date, and then awards like before. Can avatars not automatically resize? I now have this foot long gap that gives me goosebumps and I know some people like having lil avvies. Overall I like how the design resembles the old one without being drastically different. Just discovered if you make a post and go somewhere else and come back to it you can finished editing. Pretty cool for those long, essay like posts people like to write and I often wonder if they just leave their browsers open to do something else😛. However just some small, niggles from me. -Prefer usernames under the avatar rather than above. -Lack of join date and forum medals makes things look a bit bare. -Think it might be hard for newish members to find a particular staff member since there doesn't appear to be a staff list in the index. 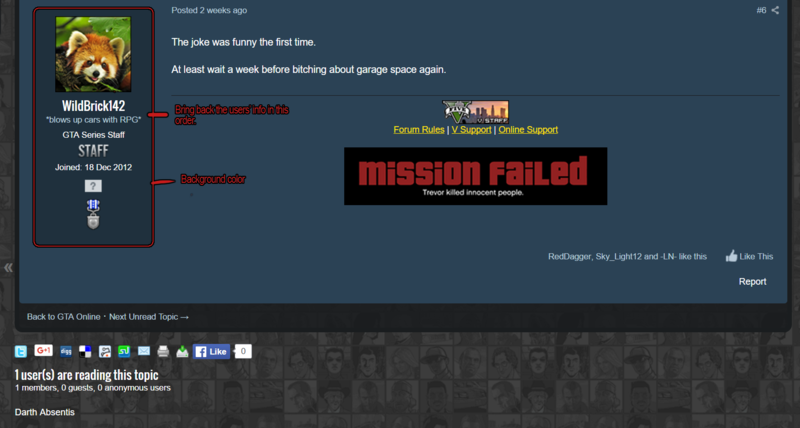 What font is that on the GTAForums logo top left? I just finished a concept with some adjustments to the "post box"
The alignment looks off, maybe it would be interesting to center the profile box? I also think it would be a good idea to bring the post number back down to the right, thus being next to the "like button". I believe there is enough space, so there is no need to leave all these elements glued together. Ignore the white like button. Apparently, Tank was faster than me on that one. (Plus I got locked out of my own computer for 20 minutes while writing this post because of Netflix freezing it with DRM.) And I was doing a task that couldn't be stopped. f*ck DRM. There are already differences between my screenshot and the forums... Jesus, you are too fast. So I have an issue with Spoilers, apparently we can't edit or change or even delete anything within them. Once you make a spoiler you're stuck with it now and forever. That's been very impractical and I hope that can be fixed soon. Being anonymous and appearing online is also still an issue. As is the persistent notifications everytime someone posts on a thread or likes a post despite me disabling notifications. This follow feature you guys added is annoying as hell. I think I'm getting quoted or liked only to find out XYZ commented on the Next DLC thread. Unsure why this is still a problem despite the fact I turned off the ability to be notified. The site looks great and there's a lot of new features but actually using the site hasn't been as smooth as the old one. Hell, this is just a meme. Atleast the pop-ups are gone forever. What I don't really like about the new theme is the fact that the new logo doesn't have anything to do with GTA. Would be much more appropriate imho, while still following the "metro" style you guys have been going for compared to the old 3D logo. Forgot to mention this but I'm not a fan of the slogan either.